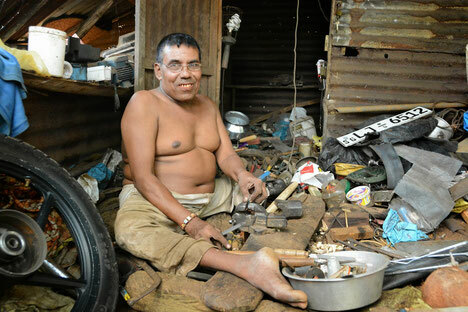 W J Christian sits on the floor in his workshop, a wooden hut littered with tools, spare parts, cables and scrap metal. Happy shrieks come from the enclosure right behind the shed where four boys are trying out the new showers – the new communal open-air bathroom which is an enormous improvement from taking a bath in a nearby stream. The showers are part of the Fair Trade water project and have been installed next to Mr Christian’s workshop for a reason: he is able to get there on his own. The 52 year old contracted polio when he was a baby and both his legs are atrophied, he can’t walk, but has to move on all fours. ‘The water project has given me so much more independence’ he says. Not only can he have a bath on his own, the villagers have installed one of the 12 communal taps right behind the house he is living in, which means he doesn’t have to ask his aunt or neighbours to fetch water for him. Not that anyone ever minded helping him out – W J Christian is known for his craftsmanship and ability to fix things – if he can’t repair it no one can. In 1995 it took him just six months built a motorised tricycle that is low enough for him to get on and off without help. Since then he not only drives to church on Sundays, he is also able to visit customers across the estate – whether you need handcrafted wooden window frames or your fan has to be rewired, Mr Christian is your man. But the bulk of his work is done in his workshop: more than 20 years ago a plantation manager asked him whether he were able to sharpen the cutting knives the tappers use – and that’s what he’s been doing ever since. It takes him about an hour to hone the chisel like tool, up to ten in a single day. He receives Rs 180 per knife and together with his other jobs he is able to make a living. The Fair Trade water project benefits 72 families, six families share one tap and everyone uses the four showers. Every family had to pay an initial Rs 100 for the installation of the taps and Rs 20 monthly. The money is collected by the water committee which in turn regularly inspects and maintains taps and pipes – i.e. the families pay for a service the water committee is expected to provide. The members of the Fair Trade committee (the 'joint body') feel that a small financial contribution by those benefitting from the project enhances a sense of ownership and responsibility. Later this year the families will be able to purchase a water meter (the cost of about Rs 2000 can be paid off within two years) and a separate pipe and faucet will give them access to water directly in their homes. It’s a huge change in a community where two to three months in a year the one water source nearby runs dry and every litre of water has to be carried from a spring some 500 meters away. The families live in what are called lines, the typical accommodation introduced by the British who established the rubber and tea estates in the 19th century. Each family occupies two rooms that can be accessed from the veranda running along several narrow, single story buildings – the lines. But with the temple, the bus stop and the enormous peepul tree these lines in Udabage almost have the feel of a proper village. And there certainly is a lot of community spirit – that the showers would be build as close as possible to W J Christian’s house and workshop was a given from the start.